Keen to improve at this mobile MOBA? We'll get you up to speed with the basics. So you've finally dipped your toes into the choppy waters of MOBA gaming with Gameloft's Heroes of Order & Chaos, but where do you start? This genre of gaming is famously ferocious in its competitiveness, and the character and combat complexity of this particular game can be overwhelming. We published our review earlier today, but to get you ready for battle we've put together some useful hints and tips to help you master this epic strategic combat game. How do I upgrade my talents in Heroes of Order & Chaos? Once you've entered the Talents section of the main menu, you're going to need two different currencies to advance your capabilities within each character archetype. First of all, you'll need cash to unlock new tiers of talents. Next you're going to need Talent Points which are acquired through leveling up in the game. Note that you can't just take the most powerful spells at the top of the tree. You're going to need to spread them throughout the talent system so as to unlock more powerful abilities later on. Hold your finger down on each talent to view the requirements. How do I communicate with my team-mates in Heroes of Order & Chaos? If there's one thing that will separate the winning team from the losing team in the game's online multiplayer component, it's the issue of communication. You can tap on the chat bubble icon to send a message to your team, and you might want to consider enabling voice-chat in the menu settings so you can execute your strategies with even greater speed. 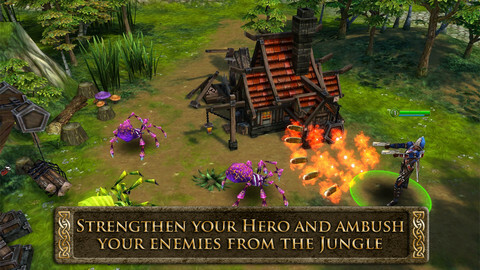 How do I heal myself in Heroes of Order & Chaos? At the bottom of the screen, next to your standard combat skill, is a potion icon. Tapping this icon will replenish your health, but note that there's a lengthy cooldown before you can use it again. Make sure you only use this when it's absolutely necessary, and your hero will call out when they're really desperate for a heal. Which is the best free hero to use in Heroes of Order & Chaos? 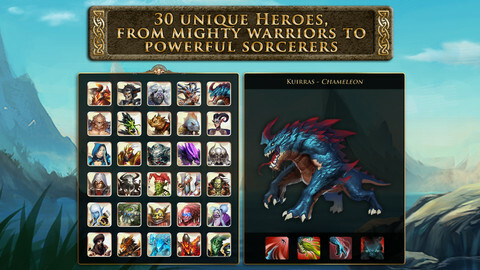 While there are thirty different heroes to take advantage of in Heroes of Order & Chaos, you'll only get three of them with the initial free download. They're pretty well-balanced, so any choice you make will be down to personal preference. Do experiment with all three of them to work out which is the best fit for your play-style however. There are four character archetypes to be aware of. Having a balanced mix of these in your team is critical to success. Deals large amounts of physical damage to the enemy. Deals large amounts of magical damage to the enemy. Protects teammates by adding buffs and auras, and can control the enemy. Takes the most damage and covers teammates. How can I get more runes in Heroes of Order & Chaos? The only way to acquire runes in the game is to head to the in-app purchase store and buy them. Make sure you fully explore all of the free content of the game before investing further, and make those purchases wisely! If you stand facing any creature in the game and simply whack away with your auto-attack, you'll come to a sticky end rather quickly. Make sure you're familiar with every skill in your arsenal, and don't be afraid to hit and run against the most formidable enemies. If you can slowly kite them around the map, you and your team should be able to take them down. Just don't kite them into an area you can't be sure is safe. How does the daily rewards system work in Heroes of Order & Chaos? Once a day you'll get to take part in a slot machine lottery for free, and be rewarded with currency, elixirs and other bonus goodies. Head to the Daily Reward section of the main menu to take part. You can also spend currency in this section to take another spin. How do I join a multiplayer game in Heroes of Order & Chaos? If you reckon you're ready to take part in the real multiplayer component of the game, hit the Play icon in the main menu and then choose either a 3v3 or 5v5 mode. You'll have to queue for a little while, but once all players are ready you'll be thrown into the match. Before that, you'll have to select your preferred hero to go into battle with, configure them, then hit Ready to confirm that you're prepared for battle. Whoever's hosting the game will begin the match once everyone's confirmed. 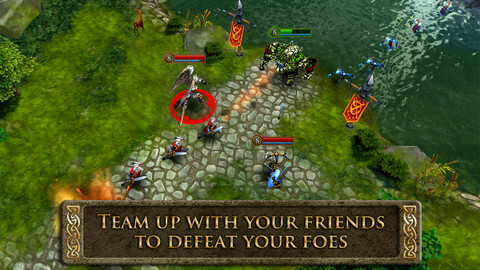 How can I automatically follow my team-mates in Heroes of Order & Chaos? If you want to take some of the fiddly effort out of keeping together, double-tap on a partner's unit to automatically follow them. Double-tapping an enemy allows you to immediately begin your assault on them, and you can use the switch target button to choose another opponent. 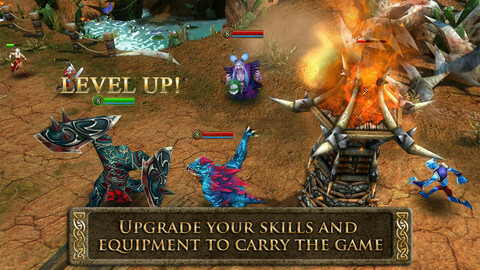 How do I buy new equipment and items in Heroes of Order & Chaos? If you want to spend some of that hard-won cash on some new upgrades, visit Ubiquitous Nick in the town at the beginning of each map to grab new items. You can also sell items you no longer need to get a little extra cash in the bank. How can I improve my skills in Heroes of Order & Chaos? Practice makes perfect in this game like no other! Whenever you make changes to your hero, it's always worth trying them out in a CPU match to get to grips with your new skills. This is even more important if you buy new heroes, as there's nothing worse then heading online with a shiny new character and getting destroyed in seconds! Don't get put off by your defeats either, as they're arguably the most useful way to become more skilled at the game. How do I create a guild in Heroes of Order & Chaos? From the main menu, scroll down and select the Guild option. From here, you can set up your own guild, create a name for it, and even apply an icon for your enemies to fear and admire. Note that you'll need 2,000 coins to create a guild. How can I watch a replay of a match in Heroes of Order & Chaos? Watching replays, particularly of your defeats, is a vital part of improving your performance. Head to the Replay section of the main menu and pick your worst moments to understand how you can do things better next time! How does the daily quest system work in Heroes of Order & Chaos? Each day, a new daily quest will be set. You might have to kill a certain number of enemies, or win a certain number of matches. Completing a daily quest will reward you with currencies and XP, so be sure to meet the objectives whenever you can to stay ahead of the competition.